Plus Size Pant Suits are standard fare for most business and social settings. Invest in a good Women's Plus Size Pants Suit and you can totally change the look by changing the blouse and accessories. I have a basic black pants suit that I can wear for business, for church events, for weddings and for social events by changing the type, style and fabric of the blouse, the jewelry, shoes and handbag. A good basic pants suit in a dark color (black, navy, brown or charcoal gray) will be a "go to" item for years. You can also wear the pieces separately to extend the wear-ability even more. Luckily, there is a nice selection available online, including business pants suits, dressier pant suits as well as pant sets and even pants sets for more formal occasions. Traditional pant suits have a blazer or jacket with matching pants and a pretty blouse or shell is worn under the jacket. Thee dressier ones usually have a flowing or draping fabric, such as chiffon. and may be embellished with rhinestones or sequins. Pants sets are usually do not have a jacket - but have a matching top and pants. If you are a different size on the top and bottom, there are also matching separates available than can give you a suit with a better fit. If you just want one pant suit, go with a traditional style back suit. It will be an absolute workhorse in your wardrobe. By changing your blouse and accessories, you can go from job interviews, the office, to church, to a night on the town to a special event. It will also work year round - you can even go with a turtleneck or sweater in the winter and a shell in the summer. Plus you can mix and match the jacket with other items in your wardrobe to create even more outfits. This is one clothing investment that you will get your money's worth. Sets with a matching top and pants is usually called Plus Size Pant Sets. Generally they do not a jacket, but rather a button front top. This gives a much different look than the traditional blazer and slacks, but is still a much dressier look than pants and tops separates. You can find them with short sleeves, making them a great and comfortable alternative in the summer months. Occasionally you can luck up and find a three piece set that includes a jacket, a skirt and pants. These are generally called "wardrobers". If you get it in a dark color like black, navy blue or gray or in a neutral like taupe or kakhi, you will be able to use the pieces separately as well as together. If you are building a business/professional wardrobe, something like this will be a great purchase. If you want something beyond the basics, or basics just aren't your style, there are plenty of other options. You can usually find suits in a variety of colors and styles. In the summer months - when almost everything is more casual - you can also find both short-sleeve and suits with Capri length pants. A few years ago, we even started seeing short suits. You can also find more casual pant sets - they are great when you want to go "nice casual" - especially for the workplace or social occasions that are casual - but not "jeans casual". If you are petite, stick with a shorter jacket. If you are taller, a longer jacket can look sleek and sophisticated. The overall length of the jacket should fall below the widest part of your body. If you carry your weight in your upper body, stick with a single breasted jacket or blazer with no or narrow lapels. If you carry your weight below the waist, stick with a jacket that falls upper thigh or below. Stay away from jackets with a defined waist unless you have a balanced body (same size on top and bottom). If you have a smaller waist and larger hips (pear shape), wear a tucked in blouse with an interesting belt for a stunning look. For a sleek look match the color of your hem (pants or skirt), hose and shoes. For the ultimate slenderizing look, wear one color from head to toe with a beautiful contrasting jacket. I love black and love to wear a black top, pants and shoes with a red jacket or blazer. 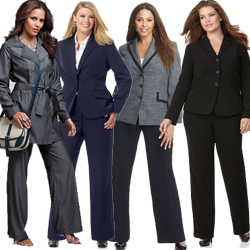 Plus Size Pant Suits are among the most popular Women's Plus Size Suits. Many of us feel much more comfortable in pants than skirts and dresses and prefer them even for business or special occasions. 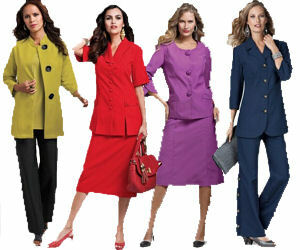 When shopping for plus size pant suits, you want to pay attention to the length of the jacket/top. For the most flattering look, you want the hem to fall below your widest body part. If you carry your weight in your hips, you will find a longer length more flattering. If you carry your weight in the middle, you can go with a shorter jacket. 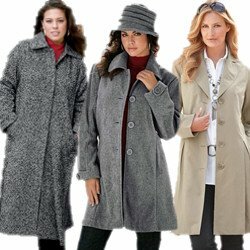 Skip the duster length jackets if you are petite - they will overwhelm you! If you have a defined waist, a pretty belt will make you look amazing. A great look is to wear you plus size pant suit with a collarless top - a shell or tank top and add a short, chunky necklace. Another of my favorite looks is to wear a long scarf draped around your neck (so it lays under your collar) and flows down the front of your jacket. Don't forget you accessories! They should match the "dressiness" you want to convey - if you are dressing up for business or special occasions, skip the flats and go with a low to high heel. Don't forget a great pair of earrings - you are not dressed without them. If it is appropriate to the occasion, rolling up your sleeves will make you look younger and thinner! 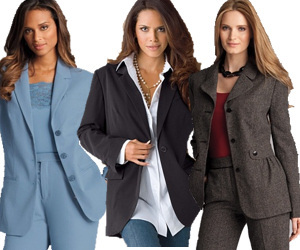 Plus size pant suits make a great addition to a professional wardrobe. When you want to look your best in front of the board or at an interview, this is an excellent choice for clothing. A well -made pant suit has an air of confidence about it, but remains very comfortable for all-day wear. One thing to remember about purchasing a pant suit is that you should choose colors and styles that will match your current blouses, skirts, and even other pants. Because you have several parts to a traditional pant suit outfit, those individual parts can all become a different element to other aspects of your wardrobe. For example, instead of wearing the pants to your suit, put on a skirt for an even more formal look. In this manner, a well-chosen plus size pant suit can really extend the flexibility of your wardrobe. Similarly, take a close look at what you have in your closet. You can make your pant suit look completely new and unique just by changing out the blouse and adding a few accessories. You can't loose with that kind of versatility. 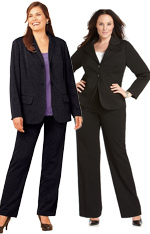 A couple of rules in buying your plus size pant suits. If you have large thighs or hips, avoid any type of cuffs. Because of where your arms lie naturally, cuffs will draw attention exactly where you do NOT want it. Women with large breasts can detract from that by getting a suit that tapers so that people's eyes naturally move downward along the line of the suit. Take care to get a suit that fits you well. Over-sized suits make you look larger and those that are too tight show every single bulge. That means you may have to go to a live store rather than buy your pant suit on the internet. Alternatively, look for outlets that offer the pant suit in individual parts so that you can adjust each piece to the unique nature of your body. Suits that come as a set rarely fit everywhere well. If your goal is dressing professionally, stay away from low cut necklines in jackets. Try to find fabric that holds a line and doesn't wrinkle easily. Natural fabrics are a good choice for warm environments so that you can really breath. Add a stylish shoe or boot to dress up the suit further. By following these simple guidelines you will end up with plus size pant suits that you can use again and again for a wide variety of situations both in business and pleasure.